So, we decided to head back to Paris a little earlier than planned, in case Avienne's stomach bug turned out to be something more. 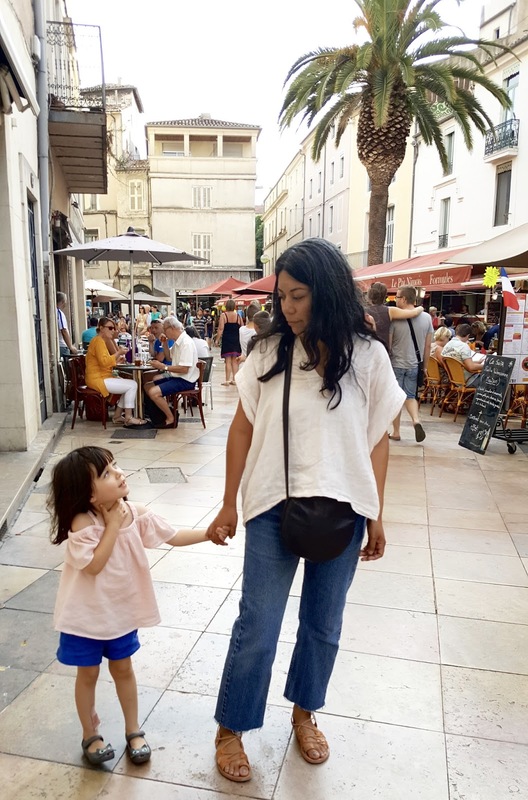 She wasn't feeling so hot when we set out, so after a quick lunch in Nice, we drove a few more hours to spend the night in Nîmes. Like many towns in the south of France, Nîmes is an old Roman colony, and we definitely caught an Italian vibe from the little time we spent roaming the streets. Avienne was pretty tired when we arrived in the early evening, so we didn't stray far from our hotel, and only went out for a carousel ride, a quick drink and some dinner. The town is really festive, and although there were probably more people out than usual for the France v. Germany game, the streets were so lively and crowded. 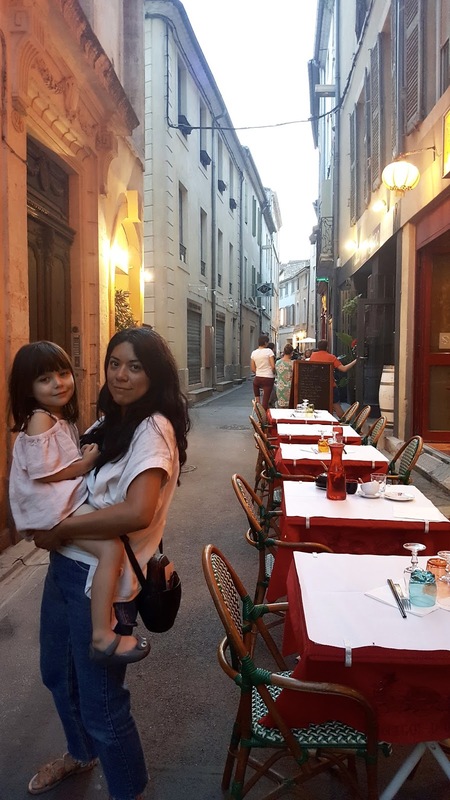 We had to grab dinner a bit early to get Avienne to bed, the upside being that we were able to snag a table at this beautiful outdoor restaurant in the middle of town. On the way there, we passed the famous colosseum which just glows in the light of dusk and makes the whole town feel so magical. Walking back to our hotel after dinner was very La Dolce Vita - everyone dancing in the streets, music playing from everywhere and people just enjoying life all over. 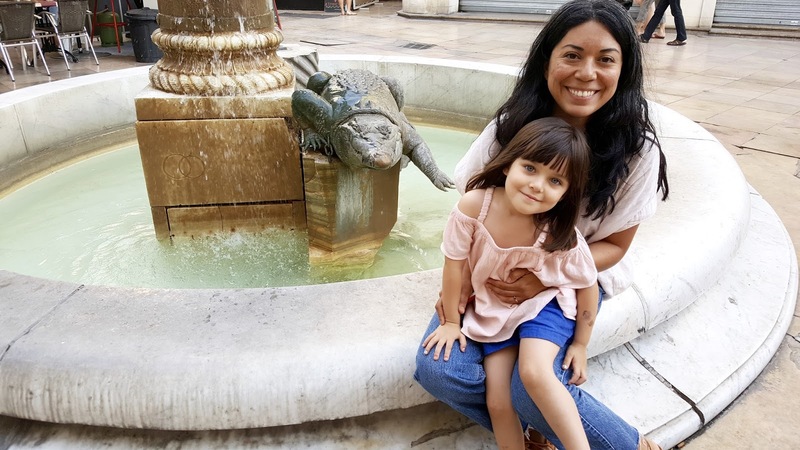 We didn't manage to do any guided tours or see the other famous landmarks in town before we set out the next morning, but I can definitely see us making another stop in Nîmes sometime in the future. Avienne was, thankfully, feeling so much better after a good night's sleep and after a little breakfast and some quick soldes shopping, we hit the road and made our way to the Paris area by dinnertime. 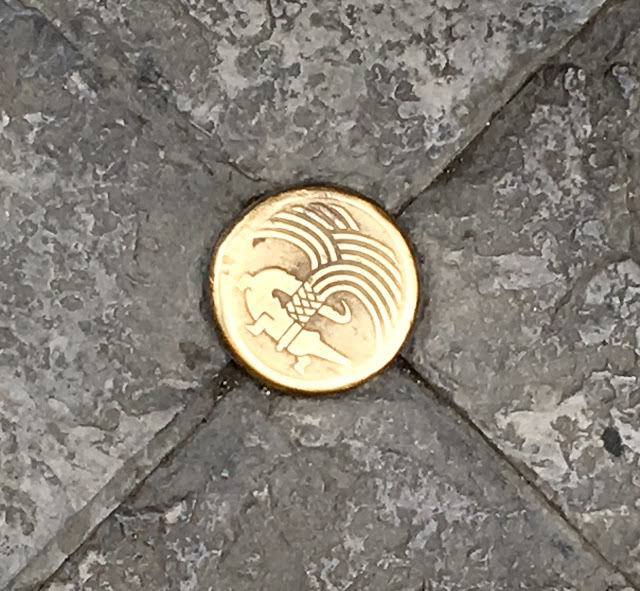 The Nîmes coat of arms is a crocodile tied to a palm tree, so there are little crocodiles hidden around the city everywhere, like in this gold gravure and fountain statue. Our dinner was delicious and the venue was so serene for being in the middle of the city - that picture of the little courtyard just does not do it justice! Heading to bed after a long day of driving and exploring. A smiley girl at breakfast, feeling so much better after some good sleep!